Thank you again for all of your help, the service I have received has been excellent! I have never booked a hotel in this way before but you have made it an easy and enjoyable experience! Thank you for everything, I'm really pleased with your help and fast answers. I will recommend you to everyone that will need a hotel. My wife and I would like to thank you again for your service. We spent a very relaxing week in Cyprus which we found to be a very beautiful country. The Rodon hotel was a good experience and all went well. Staff and management were very helpful. Thank you both very much for your help. My wife and I, came back from Cyprus two days ago. I want to say that we really enjoyed our stay in your beautiful country. And one of the reasons for that is the kind, warm and professional attitude we got from you and from the staff of the hotels we stayed at. So thank you very much and we hope to come back to Cyprus in close future. Thank you greatly for your assistance with this booking, I am looking forward to my stay in your country. If everyone is as helpful and friendly as you I am sure we will have a fabulous time. Just to let you know that my husband and I had a lovely time in Cyprus, and I can thoroughly recommend the Tetyk Apartments. It was my third visit to your island, but husbands first. He has now come under Cyprus's spell, and I hope on our next visit to look around for a holiday home. I will certainly be looking at the sites you have suggested for hiring a car, Thank you for all your help and look forward to using your company in the near future. Looking out over stunning tropical water gardens on the gentle curve of Pafos' beach, The Annabelle is an exclusive five-star hotel of unforgettable luxury and elegant charm. All the rooms, suites and garden suites are beautifully decorated and all have balconies offering uninterrupted views of the Mediterranean and the old fishing harbour of Paphos. The hotel is located near Paphos, at the heart of the Aphrodite Hills Resort, where it enjoys a tranquil setting overlooking the goddess's mythical shores. While conveniently close to cosmopolitan local centres and places of interest, it is set apart, making it ideal for travel and business on the island, with ample peace and quiet for relaxation, leisure and retreat. The Elysium Beach Hotel has a unique architectural character and a charm that provides a feeling of openness and tranquillity. Situated on the beach, close to the ancient site of Tombs of the Kings and within 15 minutes walk to the archaeological park. Close to shops, taverns and bars. A shoreline pathway enables guests to access the coastline to Paphos harbour. The Venus Beach is a five star hotel in Kato Pafos, located just 13km from Paphos Airport, offers good facilities with a hospitable atmosphere. The Hotels ideal position on a beautiful sea front area, adjacent to the Tomb of the Kings providing guests with a relaxing stay, yet Paphos town centre and the picturesque harbour within a few minutes drive. The Alexander the Great Hotel in Paphos is a luxury hotel in a sunny seaside location overlooking the picturesque fishing harbour and castle, offering its guests an exceptional combination of high standard facilities, fine cuisine and delightful entertainment. Alexander the Great Beach Hotel for those who value luxury and tranquillity, with a touch of sophistication. The Aloe Hotel is situated in the popular tourist area of Kato Paphos and only 150 meters from the beach. The Aloe Hotel combines excellent standard of food & beverage service, together with a wide variety of entertainment and animation, completed by a large range of sports facilities and water sports. Athena Beach, a superior 4-star hotel on the sandy / rocky beach of Kato Paphos offers the added bonus of easy access to places of historic and cultural interest as well as entertainment spots. It is situated just 1.5 km from the tourist centre, 2 km from Paphos fishing harbour, 4 km from the town centre, 15 km from Paphos International Airport. The Athena Royal hotel provides a warm welcome in a relaxing atmosphere, luxurious and elegant accommodation. The jewel in the crown is the friendly, helpful and smiling staff for which the group of hotels is renowned. All round they aim to meet the highest standards of quality that discerning travellers seek. The Avanti Hotel is an outstanding four star establishment situated in a prime position in the heart of the popular Cyprus coastal resort of Paphos. The hotel's modern architecture and luxurious interior decoration are designed to attract discerning holidaymakers in search of that something that makes a good holiday great. Offering you the very heart of Paphos! 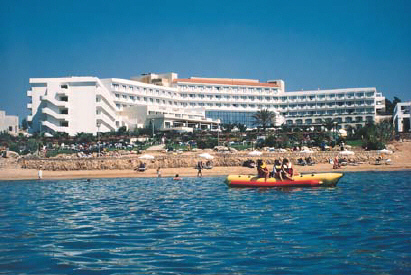 The Crown Resorts Horizon Hotel is conveniently located on the picturesque Coral Bay at Paphos, only a few minutes from the Coral Bay main area, 11km from the centre of Paphos and 300m from the sandy beach. Next to the resort there are many shops, bars and restaurants and many other extensive facilities. Directly on the beach of Chlorakas village, the St. George Hotel is only a five minutes drive from the picturesque harbour of Paphos & 20 minutes away from the airport. The hotel is bordered by rolling hills on the one side and the Mediterranean sea with its magnificent sunsets on the other. A modern 4 star hotel proud to offer its guests exceptional comfort and a wealth of amenities in an ambience of genuine friendliness and hospitality. Situated on a beautiful sandy beach in one of the quietest parts of Kato Paphos, within walking distance from the tourist and town centre and very close to the historical monuments, the Castle and the harbour. The hotel superbly situated with panoramic views of the harbour & coast. It is centrally located for shopping and sightseeing. It's position makes a wonderful retreat for those who prefer a high, cool and un obstructive place, yet within a few minutes walk from the Local Market, District Museum and Public Gardens. A short distance away are Land of the Kings, the House of Theseus & Dionysos and Saint Paul's Pillar. The Cynthiana Hotel is a little piece of paradise wedged between sea and sky, perched on a panoramic headland this is an extraordinary hotel. Situated in possibly the most unique and beautiful spot in the region, the hotel is within easy reach of bustling Kato Pafos and some of the most fascinating ruins and archaeological sites on the island. The Dionysos Hotel is named after Dionysus, the ancient Greek God of Wine, who promoted the enjoyment of "the good things in life" and in particular the appreciation of fine wines & good food, enjoyed in beautiful surroundings. The staff are dedicated to continuing our mythological namesake's philosophy by offering you the very best of Cypriot hospitality. The Paphian Bay Hotel, elegant and exclusive, stands on its own private golden beach, and is ideally located; just 15km to Pafos International Airport, 2.5km from the picturesque fishing harbour dominated by the solid square fort, and only 500 metres from the nearest shops and restaurants. The Paphian Bay Hotel lies next to its sister hotel the Pioneer Beach. The Phaethon is a comfortable "club" hotel which offers an excellent range of facilities in a casual, friendly atmosphere, with many services, included in the price. Specifically geared towards those wanting activity based holidays. Apart from its numerous bars and restaurants is also boasts a lively night club. This was the first hotel of its kind in Cyprus. Queen's Bay Hotel is just 8 km north-west of the centre of Paphos town, in the most beautiful and relaxing part of Paphos. The Hotel commands impressive views of the surrounding evergreen banana plantations and sapphire-blue Mediterranean sea. There are extensive gardens which stretch down to the beach where you can watch the sun set over the sea. The Kings Hotel is a small 2-star family hotel situated in Kato Paphos on the Tombs of the Kings Road, near numerous archaeological places of interest, such as the Tombs of the Kings, Catacombs and within walking distance of the Mosaics. Pyramos Hotel is a small family run hotel based in Paphos, Cyprus. The Hotel in Paphos offers all the charm in the world with our cheap prices and luxury and spacious living. The Pyramos Hotel is about as sophisticated in spacious living and family luxury hotel yet with cheap prices for your discount holidays in Paphos - Cyprus. Situated directly on the sea front, just a few minutes drive from the picturesque harbour of Paphos. Some of the facilities include two outdoor swimming pools, one water games pool and an indoor heated pool. Jacuzzi, sauna, massage, gym, tennis court, beach volleyball, water volleyball, water polo, various video games, table tennis, billiards and darts. Indoor children mini club and outdoor children’s playground. The Anemi Apartments are located in the centre of Paphos Town, only 300 m from Paphos Harbour and Castle and 150m from the Sandy Beach. The Damon Hotel Apartments are situated on the Famous Tombs of the Kings road, in a newly developed tourist area of Kato Paphos. Relax with a drink with the lobby bar or during Summer time in the pool bar. Pool bar is also a snack bar for lunch time where you can enjoy snacks and drinks as well as enjoy a late night drink as the pool bar is opened till late. The Daphne Hotel apartments are well located in the Centre of Paphos Town. There are many shops, banks, restaurants, cafe's, bars and night clubs in the area. The sea front is only a couple of minutes walk away and the closest sandy beach is 500m away. 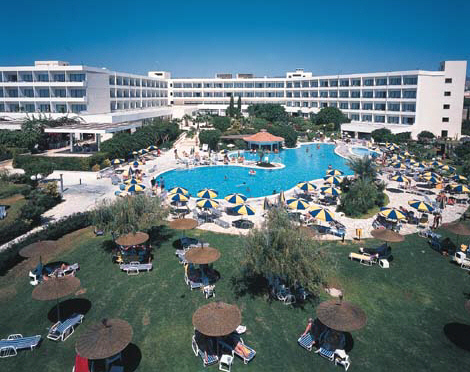 Helios Bay Hotel Apartments, a great family run holiday complex superbly located overlooking the sea. It is 4km from Paphos town on the coastal road to Coral Bay and the Akamas National Park. Guests here are mainly couples and families seeking to enjoy the freedom of self-catering within an environment which offers all the comforts and facilities of a hotel. The Basilica Apartments are situated only 250 meters from the Paphos fishing harbour and the Municipality beach, the Basilica Complex Holiday Resort is a Mediterranean resort of charm and distinctive Cyprus flavour. Reflecting the unique culture, heritage and archaeological site of St. Paul’s Pillar and the famous Paphos Mosaics. Just 300 meters from the sandy beach stand the low rise buildings of Paphos Gardens Holiday Resort. Designed with the Mediterranean village life in mind, the Resort comprises a series of small apartment blocks based around the main hotel. The apartment blocks around the Hotel comprise of standard and superior apartments. Cyprus Hotels, not just a hotel reservation service but real people with local knowledge and experience, who care about your stay and hotel accommodation needs.